The Gregory Amundson Show, Episode 9: Qualities of the Warrior Spirit. 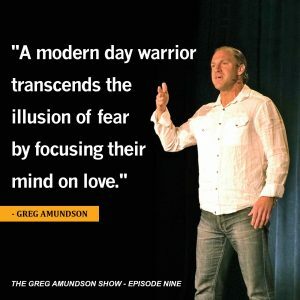 In Episode 9 of “The Greg Amundson Show” Greg begins the process of articulating the specific qualities which define the modern day warrior. Rather than focusing on the external pursuit and ideology, Greg encourages the listener to turn their attention inward to their heart and mind, and to specifically focus on the quality of their thinking and speaking. Greg shares three incredible warrior-tradition stories, including scenes from King Leonidas, King Henry IV, and the life and ministry of Jesus Christ, all to illuminate the consistency of these great leaders ability to master the power of the spoken word. For all those interested in walking the path of a warrior, this is a groundbreaking Episode. Welcome to Faith Works Ministry!